This year, Schlage announced the arrival of the alarmed lock system. 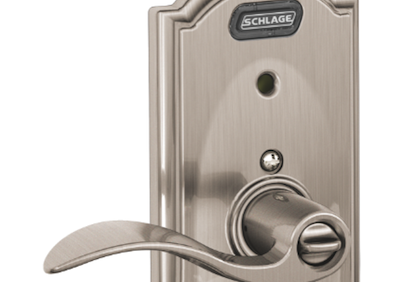 Unlike traditional alarms, which trigger only when the door is opened, Schlage’s new alarmed lock activates on first impact. These locks can detect a wide range of actions and alert homeowners of any activity with their entry doors. For example, the lock will sound an alert if someone is kicking the door or tampering with the lock. One Housing Zone editor pointed out that this system can also help homeowners monitor their children by alerting them when the door is opened. This product will be available in early 2012. You can learn more about Schlage products on the National Lumber eShowroom. Thanks to HousingZone.com for their review of the Schlage Alarmed Lock System.